In social media, hashtags are words or phrases that follow a hash (or pound sign), and they’re used to tag or categorize the subject or topic of a post. You can think of social media as one big filing cabinet and inside there are billions of posts. Hashtags are a way to organize those posts into categories that users can easily search to find or share content with people who share common interests. The nuances of how hashtags are used vary slightly on each social media channel. In this blog, we’re going to focus on Instagram, a hotspot for hashtags. 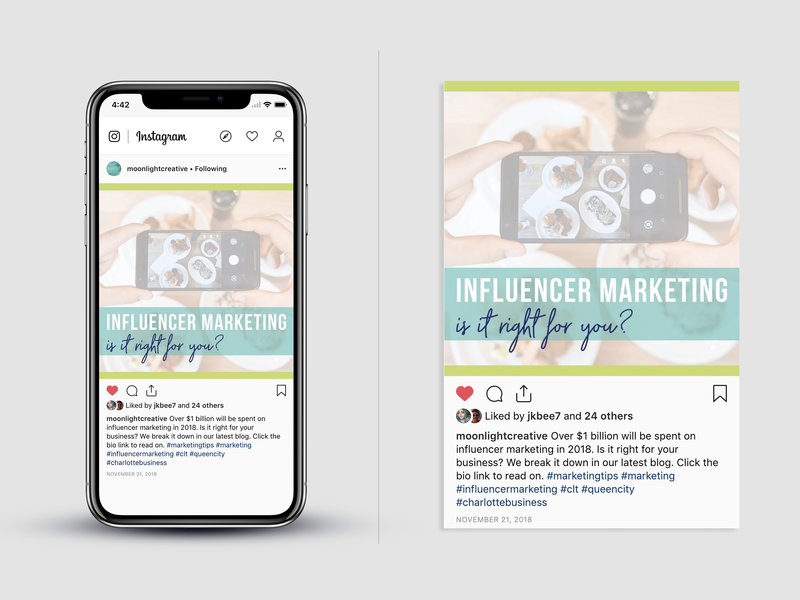 Incorporating hashtags into your Instagram strategy can help make you more discoverable to your ideal audiences, resulting in more followers. And where there are more followers, there are more post engagements! Instagram posts with at least one hashtag see an average of 12.6% more engagement. Not only can hashtags grow your brand, but they can also help you connect and engage with your followers, giving you an opportunity to join and share in conversations that are valuable to your followers. Any person or brand can use existing hashtags or create new ones. If you’re business looking to reach more users or connect with your followers, hashtags can help! But, if you’re business looking to blast your message to the masses, well first, don’t do that, but hashtags will not get you more followers. It’s very obvious (and obnoxious) when brands use hashtags as a promotional tactic and you risk losing the followers you already have. Let’s use the popular hashtag #MondayQuotes to break it down. It’s Monday morning, perhaps the least popular morning of the week. For some reason, your coffee is taking way longer to kick in and you’re not ready to start your day. So you open the Instagram app to search for some inspiration (or maybe a distraction). 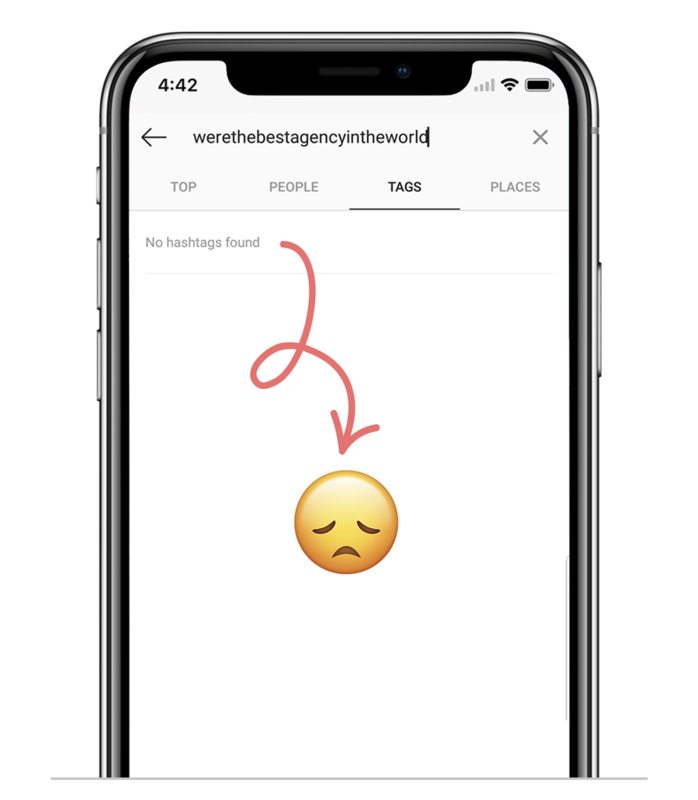 You navigate to Tags in the Instagram search bar and type “Monday.” Instagram will list related hashtags that you might be interested in, and you click on #MondayQuotes. You land on the hashtag’s page. Here you’ll see an aggregate of every post using the hashtag (in this case, over 200 thousand). The top of the page features the posts with the most engagement, but you have the option to explore posts that recently used the hashtag. You can Follow the hashtag, sending posts that use it directly to your feed. Instagram also recommends similar hashtags you might be interested in. You stop scrolling on a post from JustGirlProject. “From now on my week starts on Tuesday. None of this Monday nonsense.” A quote that’s both funny and relatable. You double-tap, along with the 1,583 other people who liked the post too. Maybe you reshare it to your feed. Maybe you start following JustGirlProject. You’ve just shared an experience with a brand. Hashtags make it easy for brands to share like-minded content or inspiration with their target audiences. Using hashtags, brands can join trending conversations or participate in shared activities like #TBT (throwback Thursday), which are opportunities to humanize their company and start actual relationships with customers. Hashtags also make your content more discoverable, which can lead to more followers. They’re especially great at engaging audiences attending a conference, event, or tradeshow. Now that we know who can use hashtags and how they’re used, we should mention a few rules to keep in mind so that they will actually help you Instagram reach and engagement. The general consensus is to use anywhere from 8-12 hashtags with Instagram posts. But don’t get crazy. Using more than 12 comes across as excessive and signals that you’re only using hashtags for exposure, not authentic connections with your target audience. 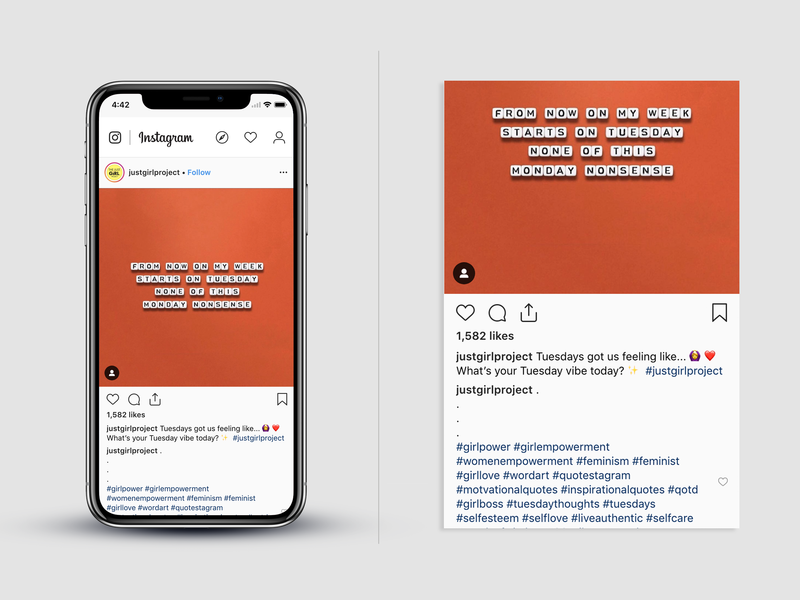 A trend emerged where users started putting their hashtags in a comment versus the actual post to maintain a cleaner look. But Agora Pulse found that reach was 29.41% higher when hashtags were used in the actual post, so we recommend keeping there. You can and should be selective with the hashtags you choose to use— use the same care and attention you would searching for the one ripe avocado in a barrel full of them. You want to pick hashtags that your fans can search quickly and easily. For example, even though we think we’re pretty great, using the hashtag #werethebestagencyintheworld is a terrible strategy. Why? Well, first it’s very long. Our audience doesn’t have the time to remember it let alone type out all those characters. Second, it’s too specific to our interests and not those of our audience. Hashtags derive power from connecting users through shared interests. Our audience is definitely not using that hashtag. In fact, nobody is— not a single post has used it. We recommend using hashtags that are moderately concise, easy to spell, and on-brand. We use hashtags that describe our post content, services, or brand. In this post about another blog post, we used tags like #marketingtips, #marketing, and #influencermarketing because they describe the type of content. We also used #clt, #queencity, and #charlottebusiness because those are the groups this content best serves. ALWAYS (always always) search potential hashtags before you use them. There’s a lot of content out there; make sure the hashtags you use are relevant and appropriate for your brand. 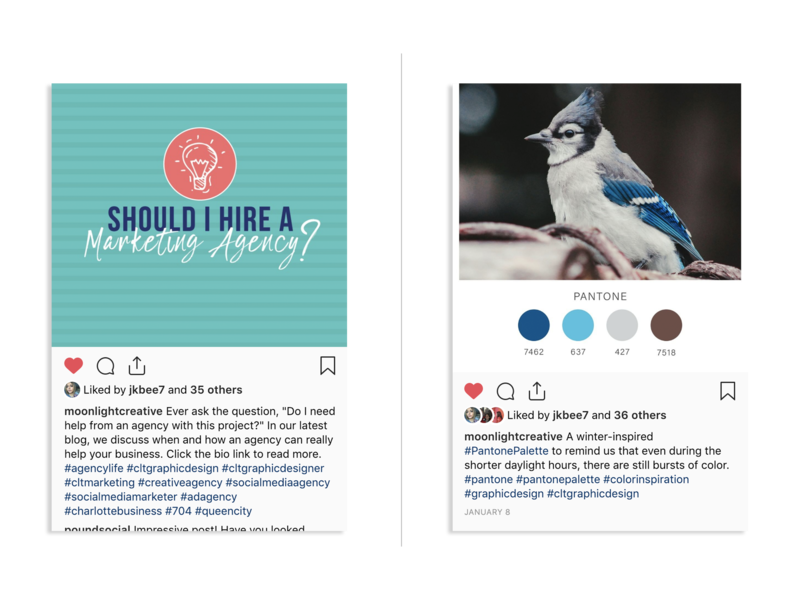 See what other content is already using a hashtag and determine if it’s content you want your brand to appear next to on an Instagram search. Also, test typing out variations of the hashtag using different cases. When Margaret Thatcher died, the hashtag #NowThatchersDead caused a lot of confusion when seen in all lower case. The tag #nowthatchersdead had Cher fans reeling that the pop-star had died. Your hashtags should reflect the content that you post. Since you’re not posting the same picture or caption over and over again, you shouldn’t be using the same list of hashtags in every post. In the two posts below, our hashtags reflect the different types of content we shared. This shows that we’re intentionally trying to connect with users based on interest and not mindlessly applying a generic list to every post. If you’re a small business, using location-specific hashtags is a great way to interact with people in your city. We use the broad #Charlotte tag, but we also use fun city nicknames that are specific to Charlotte residents like #704 #QueenCity, and #CLT. The audience using these hashtags are smaller and more targeted, which is exactly who small business want to reach. If you follow these guidelines, hashtags can boost your Instagram strategy, resulting in more followers and greater engagement. Happy hashtagging!